Reunions are a great time to renew relationships, catch up on the latest news, commemorate heritage, celebrate proud moments, and remember good times had together. Reunions can provide an atmosphere for families and friends to reconnect, share memories, create new ones, and pass on traditions. Reunions are a joyous time, but a successful family, school or military reunion involves detailed planning and thoughtfulness. Relieve some of the planning stress by submitting a request for proposal today. Information from multiple venues will be provided directly to you. 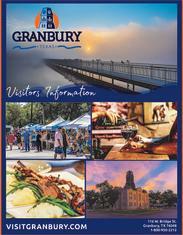 Granbury is a wonderful location to hold reunions! We are conveniently located just southwest of the DFW Metroplex, right on Highway 377 with easy access to I-20 and I-35. Our area boasts a multitude of restaurants, lodging facilities and parks, as well as meeting spaces that can accommodate groups of almost any size. One of the things that sets Granbury apart from the rest when looking for the ideal reunion space is the array of options we have. Granbury has many distinct facilities that host everything that planners want, all in one location.